Although the CBD market is now in billion-dollar territory, it still isn’t a particularly well-regulated industry. It is legal in most U.S. states (with caveats) which has seen the rise of hundreds of CBD sellers. Unfortunately, they are not all reputable, and with so many ill patients desperate for a cure or at least some relief, it is easy to miss the red flags. Luckily, there are plenty of trustworthy companies and it is our goal to bring you fair and unbiased reviews so that you can find them. Today, I look at PureKana, a fledgling CBD seller with a burgeoning reputation. More specifically, I am reviewing their 300mg CBD oil in mint flavor. As is the case with most CBD companies, it isn’t easy to find detailed information about the founder(s). PureKana has its main office in Parsippany, New Jersey, but also has an office in Watford, United Kingdom. A quick Google search discovered that the Company Director’s name is Jeffrey Yauch and the company became incorporated in the UK in October 2017. Oddly enough, the company’s website says it is based in Los Angeles. In any case, PureKana promises to only sell CBD from industrial hemp that contains little more than trace amounts of psychoactive compounds such as THC. Its ultra-concentrated hemp CBD is grown and harvested in specific ‘microclimates’ and, after harvesting, the hemp is processed and undergoes CO2 extraction – the cleanest and safest form. According to PureKana, its products are legal for sale in all 50 states and you can use them as natural additives or place them in your food. Most importantly, its CBD hemp oil is free from solvents, herbicides, pesticides, and chemical fertilizers. In other words, you get nothing but CBD plus a smattering of added ingredients handpicked by PureKana. The company backs up its claims by inviting users to check out their third-party lab test reports online. PureKana offers a variety of products including edibles and CBD capsules, but its oil is by far its biggest seller. It comes in Natural, Vanilla, and Mint flavors and I am reviewing the latter. The oil also comes in three strengths: 300mg, 600mg, and 1,000mg but I elected to check out the weakest version to see if it offered any relief for my elbow pain and chronic insomnia. All of PureKana’s CBD oils come in 30ml bottles so when you purchase the 300mg version, bear in mind that each ml has 10mg of CBD. If you need a stronger dose, I recommend looking at one of the other two options. According to the company, its mint oil is organic, non-GMO, lab-tested, free from solvents and chemicals, and it contains less than 0.02% THC. PureKana suggests that the bottle contains 40 servings, but I don’t feel as if 7.5mg of CBD is enough for most patients. The bottle comes with a 1ml dropper, so I elected to take a full one to get 10mg of CBD. I placed it beneath my tongue and held it in position for around two minutes. It felt like an hour but you get used to the sensation. The mint taste is refreshing and low-key and there is clearly sweetener involved in the mixture. At $54 per bottle, it isn’t cheap and you’ll get approximately one month’s supply. On the plus side, it is full-spectrum, meaning that the CBD is accompanied by various terpenes, flavonoids, and cannabinoids. In theory, this combination should increase the efficacy of the oil. I wasn’t expecting miracles, nor did I receive any. To be frank, I didn’t feel much in the way of relief from my elbow pain. After using the product for several weeks, my elbow still flared up after performing chin-ups, so that was disappointing. It’s pretty likely that I require a lot more than 10mg of CBD to help alleviate the pain. This of course means spending significantly more money; although it still works out cheaper than addictive painkillers in most cases! What I will say is that PureKana’s mint CBD oil helped improve my sleep markedly. As a lifelong insomniac, six hours of uninterrupted sleep is the Holy Grail and this oil helped me achieve that most nights. As a result, I feel more energetic in the mornings and there is no substitute for feeling great at 6:30 am! I am not generally an anxious person but I did feel noticeably calmer from around a week after I started taking this CBD oil. There are mixed reviews, ranging from people almost spontaneously combusting with joy to those who feel ripped off. The majority of users felt as if 10mg of CBD a day isn’t enough for chronic pain, and I have to go along with that consensus. Where PureKana’s CBD oil excelled, according to customers, is its ability to reduce anxiety, alleviate stress, and calm body and mind down to the point where sleep is easily achieved. Incidentally, PureKana suggests that you will receive your package within 3-9 working days. I received it in 5 days so no complaints on that score. By the way, if you’re not happy with PureKana’s CBD oil, you can request a full refund within 30 days of purchase, although you have to pay for return shipping. If you’re seeking a miraculous cure for what ails you, this CBD oil from PureKana is not the answer. You should consider the 600mg or 1000mg bottles if you are seeking relief from chronic pain. However, the 300mg is more than good enough to help with anxiety, stress, and insomnia. 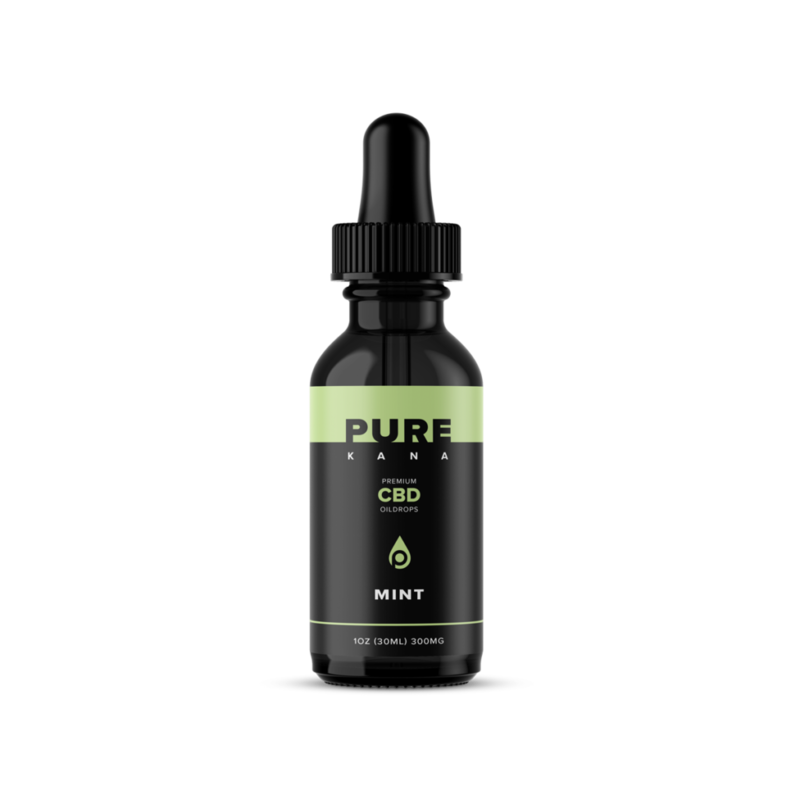 PureKana is a reliable company, its mint CBD oil tastes good, and it offers real effects to users. The main downside is that it’s fairly expensive and rival firms sell similar standard CBD oil for less. Even so, I recommend PureKana if you’re looking to dip your toe in CBD waters for the first time. Oh and don’t forget to use our PureKana coupon code: 10OFFCBD1 it will give you a 10% discount. No pesticides, herbicides, solvents or other chemicals used in the hemp growing process. Third-party lab tested to ensure safety, legality, and potency. Effective in the treatment of insomnia, anxiety, stress, and depression. 10mg of CBD per serving is ideal for newcomers. It isn’t potent enough to deal with chronic pain or conditions such as epilepsy where a significantly greater dosage is required. Will work out to be expensive if used to treat chronic pain.